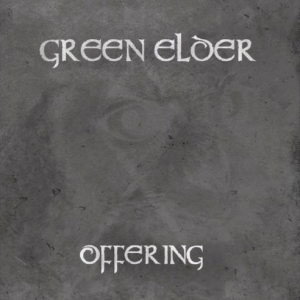 Based in the United States, Green Elder is a neofolk act that focuses quite simply on minimalist, nature driven sounds that can capture the breadth of mountainsides and entire forests in six minute songs. Released back in April, "Offering" is a simple, two track EP whose beauty extends way past the thirteen minute run time the song offers. Both elegant and mature, at the same time connecting with a relaxing spiritual environment, "Offering" is a release that all neofolk fans should not pass up by far. Gentle plucking of strings combines with the simple ambiance of Mother Earth, making the overall sound ethereal. The celestial vocals provided not only charm and bless, but they provide a wonderfully added delicate touch to the overall production. This is an EP I would take on a walk through woods, to stare out over a cliff at the end, shut my eyes, and feel the warm embrace of the wind as the music hugs my ears. This is an offering of quality over quantity, and though I wish it were a bit longer to experience more of Green Elder, they have provided a mystical heaven with "Offering".